Thank you for your interest in giving to Algoma University! Your generous gifts help to provide funding for scholarships and bursaries, library resources, varsity athletic programs, capital funding to the university and support for special projects. The Algoma University Annual Campaign exists to support our students’ success. Generous gifts to the Annual Campaign from alumni, staff, faculty, parents, community partners and friends are an important expression of support. Your gift to the Algoma University’s Annual Campaign helps to create new opportunities for our students. Gifts to the Annual campaign provide funds for our Scholarships & Bursaries Program. Algoma University’s scholarships program attracts the best and the brightest students by recognizing their academic excellence. Gifts to the Annual Campaign provide Entrance Scholarships to high school graduates and college transfer students who have demonstrated academic excellence. These scholarships are carried forward through to graduation for students who maintain their academic achievements. Bursaries help ensure that post-secondary education is accessible to all students regardless of their financial resources. 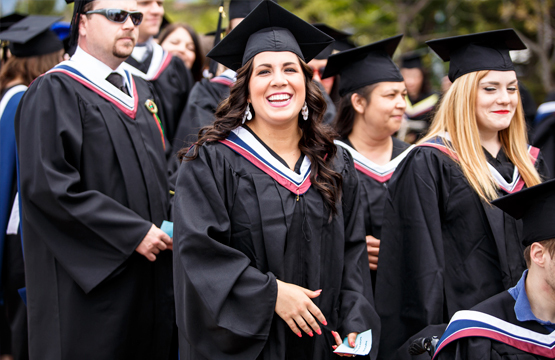 Each year over $200,000 in scholarships and bursaries are awarded to qualifying students. Please help our student by making your gift to the Scholarships & Bursaries Program. Gifts to the Arthur A. Wishart Library, including in-kind donations such as rare books and archives, will be used to enhance the collection of research and resource materials and the facilities available to students. Planning gifts of charity ensures that the causes and organizations that you have deemed important during your lifetime continue to benefit from your support in perpetuity. Your will is an important legal document that allows you to continue to care for the people, causes and interests that have mattered most to you during your lifetime. A bequest to Algoma University will provide acknowledgement of the importance you have placed on post-secondary education. Your memory will live on in perpetuity through your gift and will help students in years to come. A bequest is a planned gift made through your will which provides you with the opportunity to make a substantial gift to Algoma University in the future without diminishing your assets today. Your legacy lives on through your bequest and your estate can benefit from considerable tax savings. Gifts made through your will provide charitable tax credits that can offset taxes owed that would otherwise diminish the value of your estate. With a bequest of $20,000 or more, you can create an endowed fund that will benefit Algoma University in perpetuity. A general bequest allows you to designate a specific amount of money to Algoma University. A residual bequest allows you to direct all or a percentage of the remaining estate to Algoma University, after debts and other bequests have been paid. You may choose to make a specific bequest to Algoma University. Bequests can also be made in the form of stocks. A contingent bequest is a gift that is left to a secondary beneficiary. If the first beneficiary is unable to receive the gift, it is directed accordingly to the secondary beneficiary. Contact your professional advisors to learn more about designating Algoma University as the beneficiary of your estate and to determine if this option is appropriate for you. A planned gift may be one of the most significant gifts you will make in your lifetime. Your commitment to excellence in education can continue with a gift that is planned today to prepare for the future. Please consider discussing with your professional advisors today how you can plan to maintain your legacy and commitment to Algoma University. If you have already made arrangements to make a planned gift to Algoma University, please let us know by completing a confidential Statement of Intent (PDF) form so that we may ensure proper administration of your gift. To learn more on how you can leave your legacy, and possibly receive considerable tax benefits please contact our Gift Planning Office. A gift of life insurance may be an appropriate option for you to make a significant and lasting gift to Algoma University. There are many types of insurance policies and not all are appropriate for charitable giving therefore it is best to contact your licensed insurance broker to discuss the best option for you. A planned gift through a life insurance policy, directed to Algoma University, is a deferred gift. The commitment you make today will be realized in the future. The ability to make a significantly larger gift to Algoma University at very little cost to you. Tax benefits that can include either an immediate tax credit or a tax credit in the year of death. A gift through life insurance will not reduce the value of your estate to your heirs and will not be subject to estate taxation. There are a number of options available for making a gift through an insurance policy. You should discuss the options with your licensed insurance broker to determine which one is best for you. 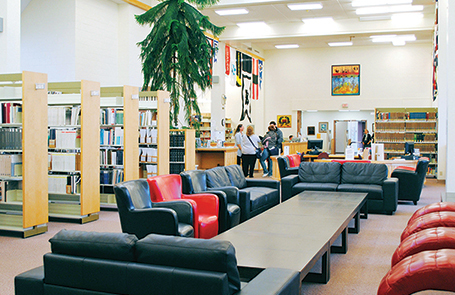 You can name Algoma University as the irrevocable owner and beneficiary of the policy. You receive an income tax receipt for the full amount of the premiums paid. Your gift creates a significant legacy for you, at an affordable cost. Many people have old insurance policies that are paid which they no longer require. You can donate an existing policy to Algoma University by transferring the ownership or making Algoma University the beneficiary of the policy. It is a wonderful way to use a policy that may no longer be of use to you and make a significant gift that will impact the lives of students. Making Algoma University the Beneficiary of a new or existing policy. Reviewing your estate planning may provide you with a cost-effective way of reducing your estate taxes. Assigning the beneficiary status of an existing or new policy to Algoma University may be an option you want to consider. Contact your professional advisors to determine if this option is appropriate for you. Naming Algoma University as the beneficiary of your RRSP or RRIF can save your family and your estate significant tax savings. A charitable tax credit would offset taxes owed and since the funds would not pass through your estate, they would not be subject to probate and other estate costs. Contact your professional advisors to learn more about designating Algoma University as the beneficiary of your RRSP or RRIF funds and to determine if this option is appropriate for you. Gifts of securities (publicly-traded securities such as stocks, bonds, mutual funds or employee stock option shares) can be a very attractive way to make a gift to Algoma University. In 2006 the Federal Government eliminated the capital gains tax on gifts of publicly traded securities to registered charities. Significant tax savings could be yours when you make a gift of securities to Algoma University. You will receive a charitable tax receipt for the fair market value of the gift of securities. Value is determined by the price of the security on the closing date when the gift is received by Algoma University. Your capital gains tax could be eliminated when you make a gift of securities to Algoma University. If you donation exceeds your eligible amount for a tax credit, in the year you make the gift, you can carry forward your tax credit for up to five years. Gifts of securities should be made in consultation with your professional advisors. Find out how you can make a significant gift to Algoma University and receive considerable tax savings. If you are 65 or older and want to make a significant donation to Algoma University but you still require the income from your assets, than exploring the benefits of a charitable remainder trust as part of your estate plan may be an option you wish to consider. A charitable gift annuity allows you to give a gift, save tax and increase your income. Contact your professional advisors to find out how establishing a charitable gift annuity can help you to secure a stream of income, while making a significant contribution to Algoma University. Charitable Remainder Trusts provide you with an alternative to leaving a bequest in your will – and there are immediate tax benefits. With a Charitable Remainder Trust you can make a gift now, receive an immediate tax benefit, and continue to use or derive income from the asset for a specified number of years. When the specified term ends, the remainder is distributed to Algoma University, providing a legacy for the donor and having an impact for years to come. Contact your professional advisors to determine if a charitable remainder trust is right for you. A bequest or planned gift is a thoughtful way of approaching your support for Algoma University and future generations of students. Please take a moment to complete this confidential Statement of Intent (PDF) form and return it to us. 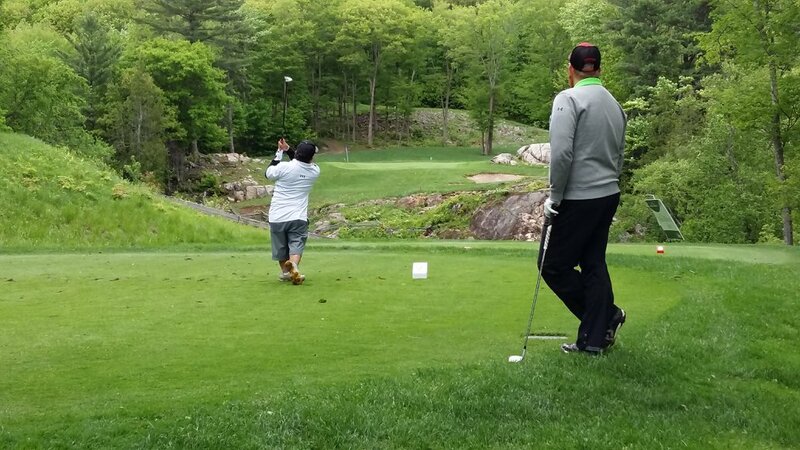 The Algoma U Classic Golf Tournament is one of Algoma University’s premier fundraising events. 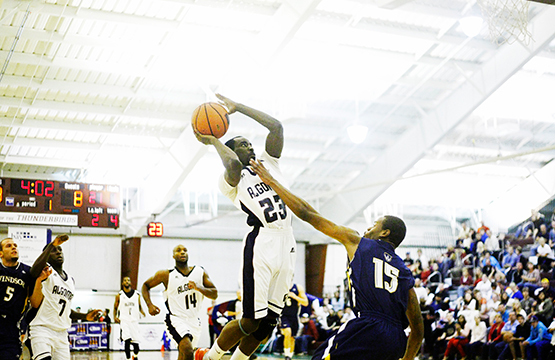 This annual tournament is hosted at Sault Ste. Marie’s beautiful Crimson Ridge Golf Course. Golfers and sponsors join together to golf “fore” education, raising funds for the Algoma University Scholarships & Bursaries program. Since its inception, the Algoma U Classic Golf Tournament has raised over $415,000. 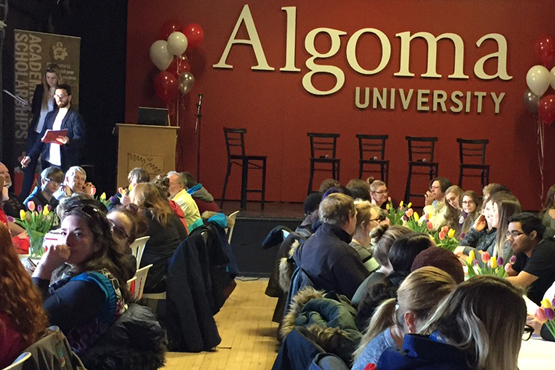 These funds provide Awards of Excellence to first-year Algoma University students. To register, fill out and send in the Golf Tournament Registration Form (PDF). The John R. Rhodes Scholarship was established in 1979 through generous donations from friends and family of the late John Rhodes. This prestigious scholarship, valued at $3,000 is offered annually to a student entering their first year of university studies from secondary school who has demonstrated academic achievement and community leadership while involved in political, social, or academic activities. This scholarship is renewable for up to three additional years providing the recipient maintains a minimum average of 80% each academic year on 30 credits taken in two consecutive terms. Algoma University proudly hosts the annual John R. Rhodes Scholarship Dinner. This event serves to honour the memory of John R. Rhodes by raising funds to offer this prestigious scholarship to meritorious students at Algoma University. Each year, up to four students may carry this scholarship, requiring a total financial commitment of $12,000 per year. Each year, the John Rhodes Scholarship Dinner Planning Committee selects an honourary speaker who embodies the integrity, leadership, vision and commitment to community services that was the hallmark of John R. Rhodes. Born and educated in Sault Ste Marie, John R. Rhodes began his career in broadcasting as a radio and television personality on CJIC in the 1960s. Mr. Rhodes was elected to City Council and served as Mayor from 1969 to 1971. He went on to serve in the Legislative Assembly of Ontario from 1971 to 1978 as a member of the Progressive Conservative Party and was a member of the provincial cabinet in the government of William Davis as Minister of Transportation and Communications from 1974-1975, Minister of Housing from 1975-1978 and Minister of Industry and Tourism in 1978. This year’s dinner honours “The Hollingsworth Family”, and will take place at the Water Tower Inn on Wednesday, October 17th, 2018, with a reception starting at 6 pm and dinner at 7 pm. Have Some Questions About Giving? We are happy to help with any questions you might have about giving to Algoma University. Please fill out this form, and our team will respond as quickly as possible! Adopting an Algoma U Thunderbird allows alumni, friends, family, and the community the opportunity to support our student athletes. Your generous donation has a direct impact on the quality of the program, strengthening our commitment to excellence in athletics, enhancing the experience for our student athletes, and helping to build our future leaders. Algoma University student athletes work hard and make considerable sacrifices to maintain their academic standing while training and competing in their respective sport. Each year student athletes log thousands of kilometres and many long hours traveling to and from competitions across Ontario, Canada and the United States. For more information, view our Adopt-A-Thunderbird Brochure (PDF). Whether you choose to give by cheque, credit card, direct deposit or by establishing a monthly pledge, we have a number of convenient ways to help you make your gift to Algoma University. You can donate now by credit card (Visa, MasterCard or American Express) through a secure, online transaction at CanadaHelps.org. To make your gift by telephone using your credit card (Visa, MasterCard or American Express), contact Bev Teller, Alumni & Development Officer at 705-949-2301, ext. 4125. Each year volunteers from our Alumni & Development Office reach out to our alumni by telephone to update your information, to share in your special milestones and good news, and to ask for your support of our Annual Campaign projects. We’re happy to meet with you personally to discuss your giving interests and opportunities to support Algoma University. Contact Bev Teller, CFRE, Alumni & Development Officer at 705-949-2301, ext. 4125 to arrange a time.